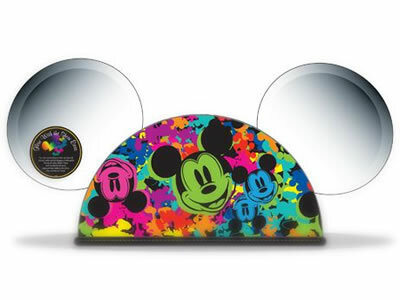 Last year, Disney unveiled new LED-enabled Mickey Mouse hats that interact with Disney California Adventure shows like World of Color, a feature they call Glow With the Show. Disney Creative Entertainment Technical Director, Chuck Davis explains in the video below. p.s. Doesn't he seem to have the coolest job ever?? This video above was taken during a special closed viewing of the show for annual passholders to test out the hats, which they handed out for free. LUCKY! The hats actually have a simple circuit inside, which you can read about in a teardown at the blog Stuff Andy Makes. Excuse me while I geek out a little about the components in this thing. There is a battery, switch, and a small Texas Instruments microcontroller which acts as the brain. Each ear is equipped with two RGB LEDs which can individually emit red, green or blue, or any combination of those three colors, including white. Side-note: The RGB LED is actually just three individual LEDs packed into one package. Here's a similar surface mount RGB LED in a 3.5 mm × 2.8 mm package with four pins: one for red, blue, green, and a common pin which can either be a common anode or cathode. Isn't it cute? You can see the little wire bonds connect to the common pin at the top right quadrant. Four pin surface mount LED package, with three individual LEDs and a common pin. The interesting aspect of the hats isn't so much the LEDs, it's the data synchronization. The hats 'interact' with shows in the park depending on where you're standing. Sounds magical, but it's actually possible through simple short-range IR communication, or in other words, at slightly longer wavelengths than visible by the human eye. Note the x-axis is log scale here. Most consumer IR products operate at wavelengths around 900 - 950 nm. For the World of Color shows, the audience viewing area is divided into 40 different zones, and IR transmitters located throughout (on speaker towers perhaps) that transmit different data signals. The signals are 'seen' by an IR receiver located in one of the ears of the hat. As Chuck explained above, it's the same way remote controls wirelessly transmit information to your TV. There may be some position triangulation using signal strengths of neighboring transmitters as well, but that's pure speculation. IR transmitters are not new technology, they're often just a GaAs-based LED plus some lenses to control the transmission angle. Sometimes it's a laser diode. The receiver is a photodiode, which is basically an LED operated in reverse: shine a light at it, it generates a current, like solar cells. Here's a tiny surface mount IR receiver similar to the one in the LED hat, by Vishay. You can buy reels of these tiny IR receivers at less than $0.60 a pop. IR wavelengths fall just outside the visible spectrum so you can't see them, but the 'light' emitted from IR transmitters otherwise has the same properties of visible light. One of these properties or requirements is line-of-sight (LOS), meaning: if you're wearing an LED Mickey hat and you're standing behind a tree or your head is turned the wrong direction, your hat may not 'see' or 'receive' the transmitted signal. Line-of-sight of IR components are demonstrated nicely in this Youtube video. Fun fact: Plenty of wireless communications, such as radio, also depend on line-of-sight which is why radio towers and repeaters are often placed on top of mountains. Another fun fact: Fluorescent lighting (including compact fluorescents) can emit spurious light in the IR spectrum, and early adopters found their lightbulbs interfered with IR communications of their TV remotes, causing channels and volume to change spontaneously. The problem was eventually solved by altering the operating frequencies of the respective components, however, the simplest solution is to just move or shade the lamps to remove the line-of-sight. According to Stuff Andy Makes, you CAN get the Disney LED hats to respond to your TV remote control, but doesn't say what it makes the ears do. Doesn't that make you want to get one and try?? Disney's Glow With The Show LED hats also have a tiny IR transmitters (just an IR LED) inside them in addition to the IR receiver. This feature allows you to synchronize the two hats only by bringing them in close proximity, as demonstrated by Erin of the Disney Parks blog. Neat, huh? Are the receivers just photodiodes, or are they phototransistors? I would think that the intrinsic gain of phototransistors would make the circuitry simpler and cheaper, and it has to be cheap for Disney. The IR receivers include a PIN photodiode and a transistor circuit.